Ninety years ago, in 1926, a huge construction project began in Gatineau to build what was one of the largest pulp and paper mills of that time. In 1913, the U.S. Congress passed a bill that abolished tariffs on Canadian newsprint imports and made newsprint the first major commodity to enter the U.S. virtually duty free. Canadian producers, with a much larger supply of spruce trees for turning into newsprint pulp, began turning out newsprint at a lower cost than many American companies. As a result, International Paper decided to shift its newsprint production to Canada, creating its subsidiary Canadian International Paper in 1925. It made plans to build a giant paper mill in Gatineau, Quebec. 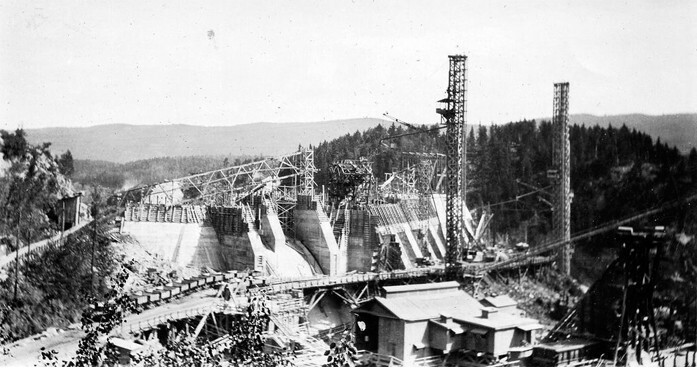 The first project they undertook was to generate electrical power on the Gatineau River. The Gatineau Power Company was created in 1926 to build three power stations – Farmers, Chelsea, and Paugan, which became operational over the next two years and employed thousands of workers for the construction phase. The Gatineau newsprint mill was built in parallel, including groundwood and sulphite pulp production and four paper machines. It started up in 1927, producing a total of 680 short tons of newsprint a day. Additional businesses were set up by the company at the Gatineau site. A subsidiary called International Fibre Board was created in 1928 to produce fibre-boards for the building industry. These products carried names such as Tentest (for insulation), Termite-Test, Hydro-Test (waterproof), and Acousti-Test (for soundproofing). Several mergers and acquisitions later, the Gatineau site today produces only newsprint from thermomechanical pulp. It continues to benefit from the power dams on the Gatineau River, which today are operated by Hydro-Québec. If you would like to learn more about the history of Resolute Forest Products and its predecessors you can purchase the recently published Resolute Roots by clicking here.